Since the 1980s, bright orange parts of a novelty Garfield phone have been steadily washing up on the Iroise coast of Brittany in France. Nobody knew where the Garfield phones were coming from, and locals had no choice but to continue collecting pieces of the famous fat cat for 35 years. According to the BBC, the mystery was finally solved this week, when a lost shipping container filled with Garfield phones “in a more complete condition than any found before them,” was discovered in a secluded sea cave accessible only during low tide. Residents had long suspected the phones came from a shipping container, but had never been able to find it. 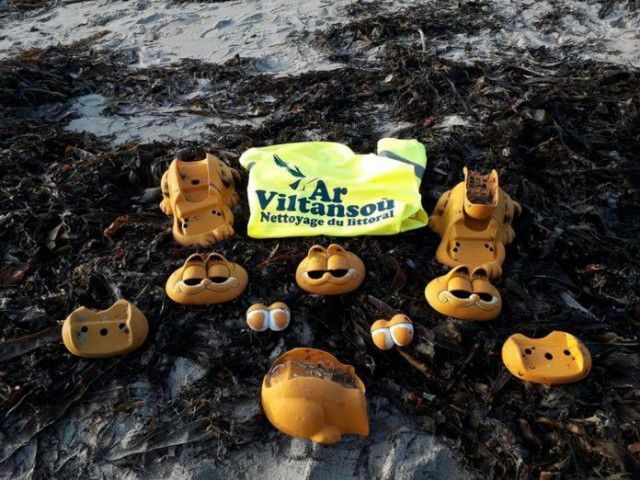 Then recently, the anti-litter group Ar Vilantsou declared the phones a symbol of plastic pollution on the beach, launching the Garfield phones as the face of their media campaign this year (honestly, I would be pretty fed up too, seeing this smug cat’s pupil-less face in the sand everyday). The campaign worked, because it caught the attention of a local farmer named René Morvan, who recalled seeing the first Garfield telephone after a storm in the early 1980s. He escorted France Info journalists and Ar Vilantsou activists to the spot, where they uncovered the treasure trove of phone fragments and cords stuck underneath stones. Unfortunately, the destroyed container remains buried underneath the rocks and is inaccessible, meaning Garfield parts will continue to wash up on shore. Being made of plastic, they’ll most likely outlast us all, much like the classic syndicated strip itself. If you want to save yourself the trip to France to get your own vintage Garfield phone, some collectors’ items can still be found on eBay. It opens and closes its eyes when the receiver is picked up, it’s adorable! Still, this is the only Garfield phone I will acknowledge.